What if you could reach back in time and change a single moment...? "What an innovative concept -- a thriller in reverse. Brilliantly conceived, perfectly executed. Fresh, exciting, bristling with originality. I only wish I had thought of it first." A mesmerizing thriller -- told in reverse! The 13th Hour is the story of a man given the chance to go back in time in one-hour increments to prevent a vicious crime from destroying his life. Nick Quinn is being held in jail, accused of the murder of his beloved wife, Julia. He knows she's dead; he saw her bloody corpse, shot in the head at point-blank range. The police tell him they found the murder weapon with his fingerprints on it in the trunk of his car. Nick is confused, grief-stricken -- and completely innocent. At 9 p.m. on July 28, a gray-haired gentleman visits Nick in the police interrogation room and asks him a simple question: "If you could get out of here, if you could save her, would you?" He hands Nick a golden talisman that allows Nick to go back in time, one hour at a time, for a total of twelve hours. With each hour that Nick travels back, he finds more clues to the identity of Julia's real killer, but he also discovers that his actions in the past may have unexpected repercussions in the future. In his race against time to save the woman he loves most in the world, Nick will find that friends become enemies, old loyalties are tested, and Julia's murder is part of a larger scheme that has its roots in greed and vengeance. Nick has the ability to save Julia, the chance to put his own world in balance, but he is venturing down a precarious route. If he hasn't set things right by the thirteenth hour, his desperate attempts to save Julia's life may lead to a far greater catastrophe than he could have ever imagined. 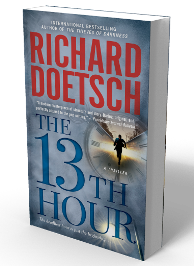 A surprising and utterly original thriller, The 13th Hour is pure page-turning suspense -- full of double crosses, cliffhangers, and shocking revelations. So you want to know a bit more? The Thirteenth Hour is a story I wrote that is not part of The Thieves series though it does take place in the town of Byram Hills where Michael St. Pierre and Paul Busch live. During the week of September 1st, it became the subject of intense interest in Hollywood with everyone, in every studio loving the book. With the dust and buzz in a frenzy, New Line Cinema and Michael De Luca stepped in and bought it before anyone else had a chance. Now, it should be noted, this book, at this time did not have a publisher but that was soon settled when my publisher for my next two books snatched it up and took it under their wing. While you may have read the Hollywood speak where they try to summarize the story by comparing it to two other films--in this case The Bourne Identity and The Time Traveler's Wife (I'm flattered)--I promise you, it is so much more than that. I will not be telling you anything about it beyond the fact that you will love and root for the characters, you will probably read it in two sittings, and it will be nothing like anything you have read before... ever. Stay tuned as I will post a brief snippet in the near future that will surely wet your appetite.